I love Beauty and the Beast. I really do. I’ve read loads of retelling and reimaginings. 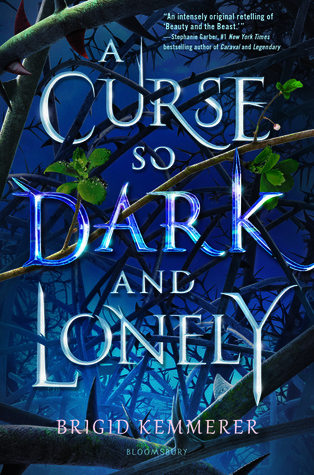 So, of course, when I saw A Curse So Dark and Lonely I just absolutely had to pick it up. It’s a bit of a portal fantasy, with the protagonist Harper arriving in Emberfall from contemporary D.C. This initially threw me a little, but it actually works perfectly with the story Kemmerer is telling. As a BatB retelling, I think the author did a wonderful job. All the classic elements are recognisably there, but with a twist. I adored the spin she put on the ending and the resolution of the curse. It was wonderfully ambiguous and something I’d never seen done before. At first, I wasn’t so sure about the ‘Beast’ character angle. For most of the book, Rhen is just a slightly arrogant (and attractive) human. I’m always a little more hesitant about this kind of Beast, because often the heroine ends up overlooking a lot of inexcusable behaviours and, honestly, because I really want to see the author come up with a cool take on the monster. Kemmerer managed to pull this off wonderfully though. Rhen is arrogant but not irredeemable, and the flashes we see of the past seasons and his actions as the beast are dark and brilliant. I really loved the idea of Groundhog Day style ‘seasons’, and that Rhen becomes a slightly different monster in each. The hints were enough for this story, but I’d love if the author ever went back and wrote some shorts based on past seasons. I’ve no experience with cerebral palsy (although I’d love to link to some ownvoices reviews if they become available) but it seemed well handled to me. Harper’s condition is mentioned when relevant to the conversation or action, but it isn’t a defining characteristic. I was really happy to see that my fears were completely unfounded: there’s no magical CP cure, and Harper doesn’t have CP as a way to solve a plot point. There’s also a touch of queer rep from Harper’s brother Jake, who features a little more towards the end with his secret boyfriend Noah. Romance and Continuing the Series. I was a little baffled by the love triangle. As much as I adored the second love-interest, there are two POVs and it’s a Beauty and the Beast retelling so it seemed a bit of a foregone conclusion. But the ending sets up some interesting things which might be developed in the next book, so I’m willing to wait and see how it plays out. I’d also love to see more of the supporting female characters, Zo and Freya, perhaps in less duty-bound roles. Great review! I’m really highly anticipating this one. The more I see of this one the more interested I am. I’m glad I’ve piqued your interest!